Your cell phone. While they’re now allowed on other PGA Tour venues, they’re definitely not allowed inside the gates at Augusta National. And don’t even think about sneaking one in as you go through metal detectors on your way inside. There are a slew of other restrictions which you can read about on the official site here. The gates officially open at 8 am but there will be many folks lined up well in advance of this. The last time I went we arrived around 7 am and were well back in the queue. This is not a bad thing as there is plenty of room for everyone. The main reason why folks get there early is to set up their chairs…which is a whole different topic. When standing in line in the morning, you’ll quickly notice that the vast majority of patrons already have their official Masters chairs in-hand, waiting to enter the gates. These chairs have a neat little personalization option on the backs to appropriately label one’s seat. The process for securing your seat location for the day is a little different than I’ve experienced at other tour stops so it requires some further explanation. After entering the hallowed gates at 8 am, it is quite important that you walk, not run, to your desired location. Attempting the latter will get you warned, if not thrown out. Once you find your desired location, go ahead and set up your chair and feel free to leave it. As long as you return to occupy your seat before play comes through, you are okay. No one will mess with your chair. There are very specific locations on where you may place your chair as well. All of them are specifically marked on the ground, allowing for walkways and eliminating the possibility of any overcrowding. It’s quite impressive how it’s all laid out. You’d never notice watching on television, but how the chairs are set up is anything but random. Right across the pond from the green on #16. Not only is it a great spot because where it falls in the round, you’ll be extremely close to the action, and the severity of the green complex means you’ll see some wild shots. 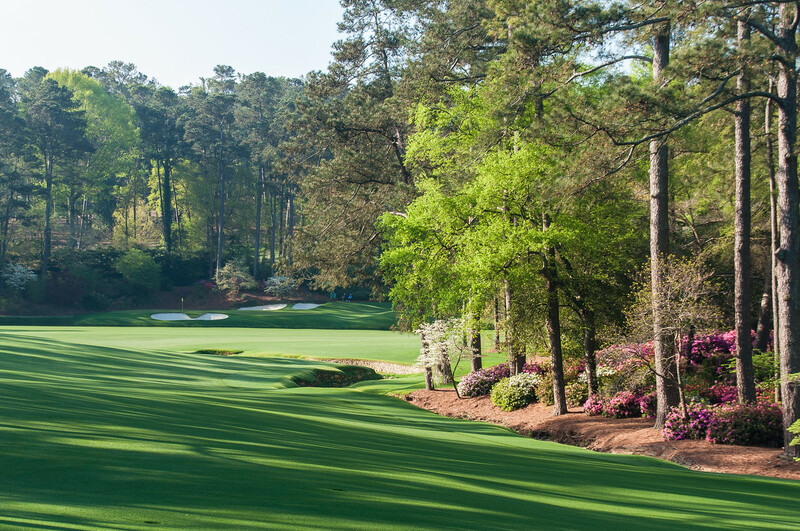 Between the 11th green and 12th tee, right in the heart of Amen Corner. 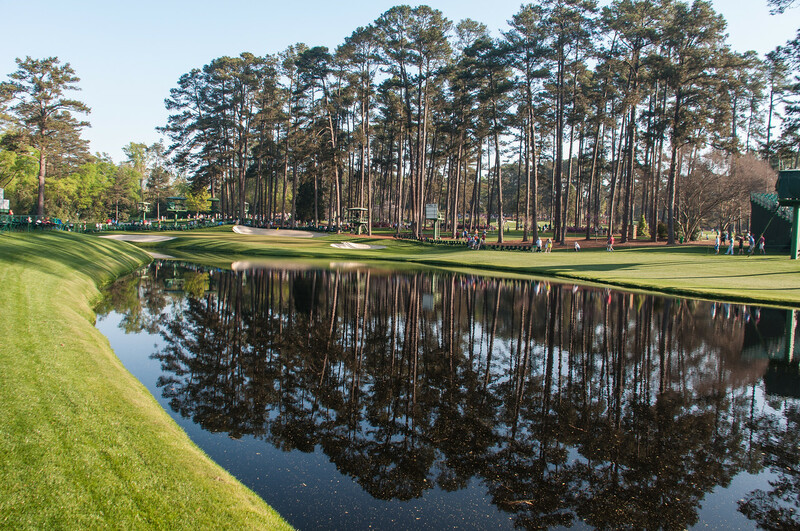 The way it sets up you’ll have a view of both the green on 11 and the entire 12th hole. There will be many patrons here, but if you arrive early and claim your spot, it’s a fantastic place to be. And when the last players come through, you can follow the leaders the rest of the way. The 18th green. Obviously the drama here can be huge. And if you don’t have a spot claimed early, you won’t be sitting on 18, you’ll be looking for a spot to stand on one of the mounds surrounding the green. Looking up the pond on 16. Notice the chairs lined up in the upper-left area of the picture. The bleachers along the pond on #16. Unlike the chair option I mentioned above, sitting in the bleachers does not require one to arrive at 8 am. The bleachers gradually fill as the day goes along and play approaches, but even after that they’ll naturally be some turnover throughout the day. The other advantage of the bleachers is sitting up a little higher affords one a view of not only the entire 16th, but of the second (and third) shots on the par 5 15th hole. I sat here in 2012 when Bubba won it, and the atmosphere was electric. I can only imagine what it would have been like in 2005 when Tiger holed his famous chip shot. The bleachers behind the 12th tee box. As I mentioned above, you’ll see the 11th green, the entire 12th hole, and the 13th tee. It’s a bit far away from all of them, but it’s hard to beat the location. Have you ever seen a concession stand or anything that might resemble bathrooms during the television broadcast of The Masters? Me neither. It’s really amazing because there are plenty of places to buy a beer or one of the infamous pimento cheese sandwiches, but they are all perfectly hidden from view. Not only are they well-hidden, they are incredibly well-run. We’ve all been to a sporting event and asked to pay four times what we should have for crappy food served by a rude teenager. You won’t at The Masters. Not only do the lines move quickly, the food is reasonably-priced and high quality and all the employees are friendly. It’s actually slightly bizarre how nice everyone is. The bathrooms are also immaculate. There are attendants moving the lines along and making sure everything is kept clean. I’ve heard others say that it’s hard to find a blade of grass out of place at Augusta, and one could say the same thing about the bathrooms there. As far as facilities go, they are nearly flawless. Don’t yell “Baba Booey” or any other semi-moronic statements after players’ swings. The marshals will give patrons a quick rundown on etiquette before the first players come through, but in case you miss that, be warned, this also could get you booted. Don’t wear your baseball cap backward. As a photographer, I’m inclined to wear my hat this way when I’m shooting. When I attended a practice round and was lucky enough to take my DSLR, a very nice marshal came up to me and simply pointed at my hat, then indicated with his finger that it needed to be rotated back to its proper position. Shop for souvenirs early and buy as much as you can afford. Not only can you check your bag and pick it up when the day is over, you can have all your goods shipped home. Spend a little bit of time on the practice range. It’s one of the best in golf and the seating for patrons is excellent. My most important advice? Have fun!!! I’m getting chills just writing this article I enjoyed my visits so much. Rarely do big events ever meet, much less exceed, expectations. The Masters does in every way. I can’t wait to go back myself. And if you needed to get any more excited for your visit, here’s the Tiger shot I mentioned above. Because policies/procedures are always changing, do not take anything written here as official policy. Please consult with the official Masters website before making plans. If you’d like to see more images from my visits to Augusta National, click here to view them on my website.